A sophisticated semi-automated biochip system perfectly designed for research, clinical, forensic and veterinary applications. 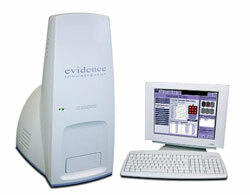 Using the same multiplexing technology as the fully automated evidence®, Biochip Array Technology, this system offers the next dimension of testing because of its many unique benefits. The Evidence Investigator is a transformational platform with wide test menu available. In addition to the extensive range of existing analytes, over 220 new tests are in development. One system for protein and DNA biochips. Multiplexing technology: one sample = multiple results. Extensive range of panels available with more in development. Minimal sample volume: 25-200µl per array (oral fluid). Ready to use biochips supplied with all reagents necessary. Multi-analyte calibrators, controls and reagents. DNA based biochips for detection of polymorphisms and mutations. A revolution in diagnostics, the Evidence Investigator has the capabilities to maximise your laboratory efficiency.